A trio of actor-written productions tours this autumn. Jack Llewellyn and Frapetsus return to his Williams family of Pontyberem and visit all points north and south. “Last Christmas” goes to venues that were missed out on the play’s first showing. 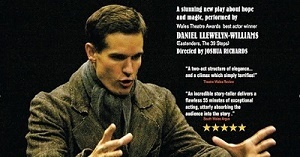 And Daniel Llewelyn-Williams reprises his one-man show first seen last December. The review of Matthew Bulgo’s play from Edinburgh repeated the commonplace observation, that actors have the advantage in writing for performance. It is not that theatre beginners who arrive from the genres of fiction or verse do not know words, because they do, but they can never know performance in the way of actors; they have lived it, for years. Daniel Llewelyn-Williams’ solo show naturally comprises dramatic rise and fall. A first dramatic climax simply terrifies, aided by director Josh Richards’ subtle lowering of the lights. Within a performance without interval the author has also fashioned a two-act structure of elegance. He seeds the writing early on with runners so that elements occur late on that refer back. A script becomes a unity via counterpoint and inner echo. He also creates a climax that is both a visual coup and an emotional surprise. This is the point that those who fret over “text-based theatre” rarely get, that decent writing is text-unbased, the word being deployed in subservience to the making of visual image. To reveal too much of the narrative would be to reveal all. Llewelyn-Williams’ character is Alan Williams, born in 1895, animated by the first visit of Houdini to the city’s grandiose Lyceum Theatre. The actor plays the ten-year old boy and leaps across the family group of ten compressed into the grandparents’ tiny house in Pill. Sentiment is avoided with memory of the arrival of the destitute multitudes from famine-gripped Ireland. The Irish are used as free human ballast for the homeward voyage of the coal ships of Wales and the details are harrowing. “A Regular Little Houdini” is a chronicle of an imagined personage but it also functions as a hymn to a real place. The very plainness, the silty grandeur and the six bridges of Newport seem to evoke a loyalty and a level of artistic response that the Chapter chatterhood has never achieved for its neighbour of a city. The boy Alan is present at the opening of the Transporter Bridge. His ambition to emulate Houdini leads him to practise his own first attempts at escapology in a pipe buried in the Usk mud. The word at the time was “self-liberator.” The great tide is experienced unnervingly at first hand. A writer of craft also understands metaphor and its use, not in a blaring manner that draws attention to itself. The unique bond between performer and audience is made by allowing the viewers to work it out for themselves. Llewelyn-Williams draws on an episode from history, the 1909 disaster of the collapse of the South Dock trench. Unlike the exploits of the self-liberators there is no escape from the inexorable rise of the tide. The writing is vivid and unsparing. “A Regular Little Houdini” is a work of theatre that marries actorly energy and versatility to authorship of assurance and maturity. Future venues up to March 2015 are Llanelli, Newport, Blackwood and Monmouth.